ITV has released a trailer for next week’s festive Grantchester special. 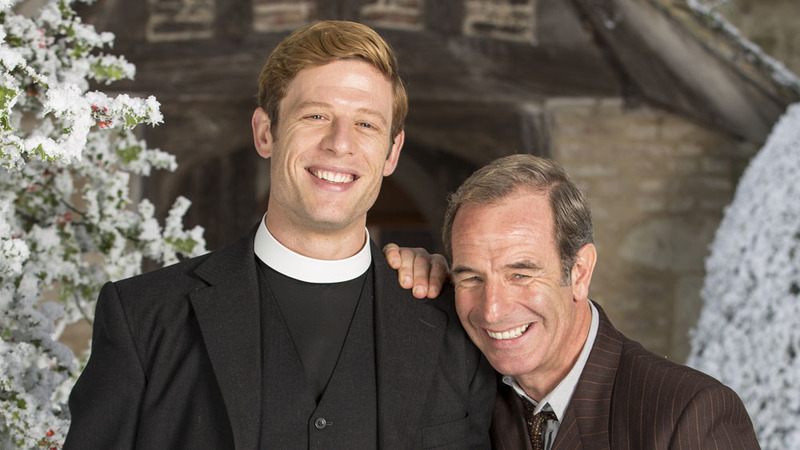 James Norton and Robson Green are back as crime-fighting clergyman Sidney Chambers and Detective Inspector Geordie Keating in the 90-minute Christmas episode. The special airs at 9pm on Saturday 24 December on ITV. The official synopsis for the episode reads: “It’s the week before Christmas 1954, and the forecast is for snow in the beautiful Cambridge village of Grantchester. For vicar Sidney Chambers (James Norton), this is the busiest time of the year and he is rushed off his feet with festive duties. Which is useful, as it means he doesn’t have time to think about his beloved Amanda (Morven Christie), estranged from her husband and heavily pregnant, who has taken up residence nearby with her Aunt CeCe (Anna Chancellor). Sidney loves her – but whether she’s married or divorced, there is no way he can be with her.